Our charity shops sell mainly second-hand goods that have been generously donated by the public. Without goods such as these to sell, the shops can’t make money to help others with sight loss. If you have any clothes, toys, CDs or other items that you don’t need, we’ll gladly take them. We’re always after the following saleable items: Ladieswear Menswear Childrenswear Shoes jewellery, handbags and accessories CDs, videos and DVDs Toys and games Books Household goods, e.g. glassware, china, crockery etc. Furniture (please note, upholstered furniture must bear a label indicating it is fire retardant) Electrical goods Specialist clothing items such as wedding dresses and Asian wear. We also sell a limited range of new goods, including greetings cards, picture frames, themed mugs and kitchen equipment. Pop along to any of our shops and see what we have. You can drop off your unwanted goods at our charity shop warehouse (at Beacon itself) or at any of our other shops. This is the most cost effective way for us. If you are unable to drop items in or they are too big to bring in, we can make limited individual collections. 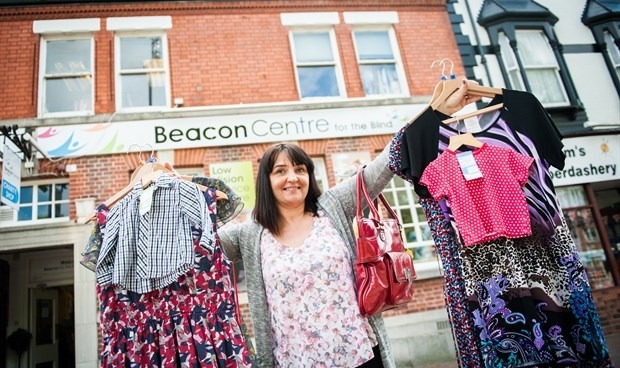 When donating goods to Beacons’ charity shops, you can help us claim an extra 25p from the government for every £1 we raise by filling in a Gift Aid form. Please ask in store for details and to receive a form. If you’d be interested in us collecting from you, send us an email at enquiries@beaconvision.org with a daytime phone number, address and what goods you would like to donate – or just call our warehouse on 01902 880111.